SunEdison's (OTCMKTS: SUNEQ) April bankruptcy was just the tip of the iceberg for solar industry credit risk. After a difficult run through the first half of 2016, many solar companies have seen unprecedented balance sheet deterioration, and by consequence, headwinds leading into 2017 appear rather threatening. In the last two quarters, executive management teams have relayed the message that solar product prices are falling sharply because of overcapacity. This scenario has been driven by two major factors: overproduction of modules and systems from manufacturers globally, and low contract volumes from customers due to the delayed approval of the U.S. solar investment tax credit. Furthermore, it is presently unclear as to when supply and demand will reach equilibrium, which is a concern for many companies. "In some markets pricing has gotten very aggressive, so we have to be careful in that regard…" while CFO, Alexander Bradley, followed up with, “...we always knew that 2017 would be a challenging year, especially as we saw margins decline from our more lucrative legacy contracts..."
Economic viability has always been an overarching theme in the solar business. Companies have fared well with commercial and utility customers whereas residential still remains a tough market given limited economies of scale. But now with underlying macro headwinds, the industry as a whole is facing a severe cash flow crunch. Overall economic stress stands nearly in-line with the last industry downturn in 2012 and continues to push higher. It's worth noting that during 2012 there were approximately 40 solar-related companies forced into restructuring, operational shutdown, or fire-sale liquidation. Some industry watchers have indicated that macro dynamics could bottom out as early as next year, but that may not be enough to alleviate existing credit risk exposure. Currently, there are nine businesses that have an unsettling FRISK® score of 1 or 2. A score this low represents an equivalent to a highly speculative non-investment credit rating or worse. 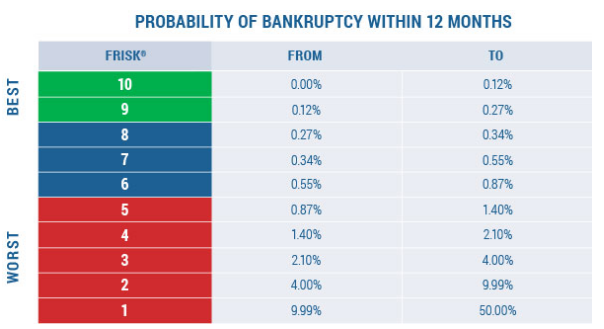 Business partners should review companies labeled in red more critically as financial stress is higher compared to ones that show as blue or green. Leverage exploded, debt/equity ratios shifted up between 34- 66%. Liquidity dropped, cash ratio and quick ratio decreased 7% and 15%, respectively. Working capital as a percentage of total assets declined from 7.3% to 4.1%. Clearly these goals are important to maintain a leading edge in this fast moving industry, but will capital markets tolerate the increasing financial risks? We think risk management skills for certain companies will undoubtedly be tested going forward. It’s worth noting that three of the five companies above have a FRISK® score of 1. The other two companies have a score of 3, which is better but still considered risky. SolarCity Corporation, one of the largest sellers of residential products, has remained unprofitable since 2011, and continues to burn through cash at an accelerated rate. The company issued a $124 million bond offering but was unable to find sufficient demand, so management resorted to purchasing significant quantities of the security. Not more than a month later, they also generated about $305 million through a cash equity transaction. There is also speculation that the proposed merger between Tesla Motors and Solar City is little more than a disguised bailout. Being that SolarCity's FRISK® score fell from a "4" to a "1" between October 2015 and today, there's clear evidence of increasing economic distress to back that belief. SunPower Corporation, a large firm with diverse end-market exposure, saw considerable gross margin pressure on its year over year performance. After recording a trailing twelve month free cash flow burn of around $1.4 billion, management showcased their strategic plans of expanding production capacity. Yet they also emphasized the importance of reducing exposure to less attractive internal projects. Over the last year, SunPower's FRISK® score dropped from a "5" to a rating of "2". Some of the solar companies we highlighted possess various financial cushions, including inventory control, labor cost reductions, capital expenditure budget cuts, and in certain cases, the tailwind of falling poly-silicon commodity prices. Using these levers could help alleviate the risk of financial distress and, ultimately, bankruptcy. At the same time, however, this period will prove to be a large hurdle for the industry's more distressed names as dependence on external financing is becoming increasingly complicated. Although solar has become more economical for customers in recent years, we believe today's challenging Solar PV market revives industry bankruptcy risk. During a cyclical industry downturn, it's not about beating the next player, it's about surviving. Do you know which of your large global customers or suppliers are experiencing growing financial distress? GET A PERSONALIZED RISK ASSESSMENT.